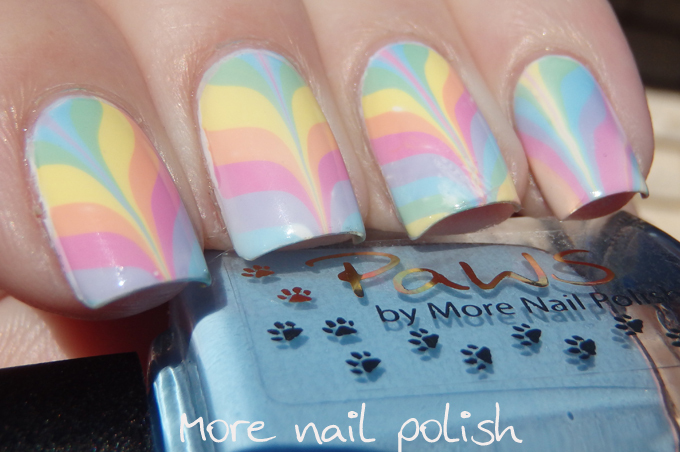 Not satisfied with my rainbow bright shades of water marbling polishes, I mixed myself up a collection of pastel water marbling polishes too. I messed the tip of my ring finger by just being clumsy, and again trying to save time by doing two nails into the bullseye at one time. That's it, I'm not going to do that again. I really love these pastel shades, they are all roughly the same tone of colour which makes then such a lovely collection. Now there are lots and lots of water marbling tutorials and videos out there (trust me, because I've watched and read just about all of them) But here are some additional things I learned that I aren't mentioned very often, and they might help you if you are struggling with water marbling. 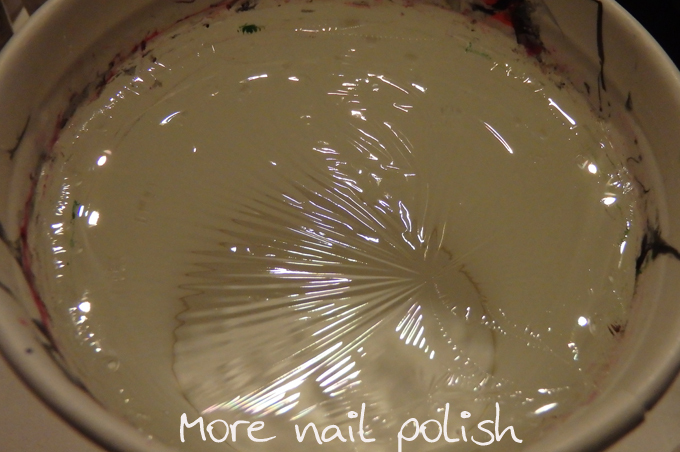 The number one issue most people talk about is the polish not spreading. Yep, this was exactly my issue. 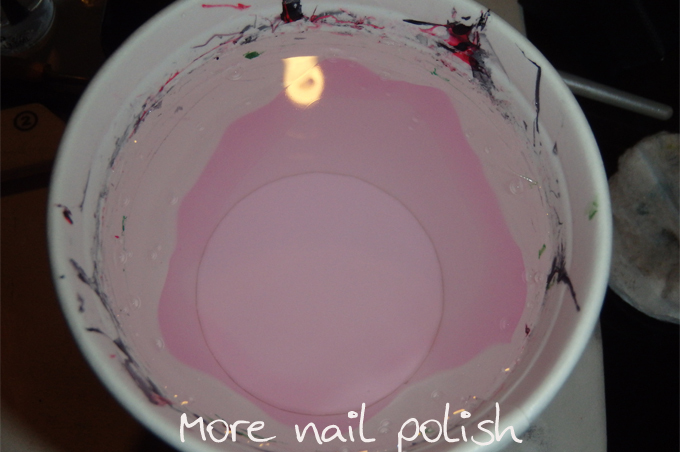 First up, you have to use the right polishes. That is the most important thing. The the polishes don't spread you will never get a good bullseye. As I don't have a lot of experience with brands of polish that work well, I suggest you google that one. 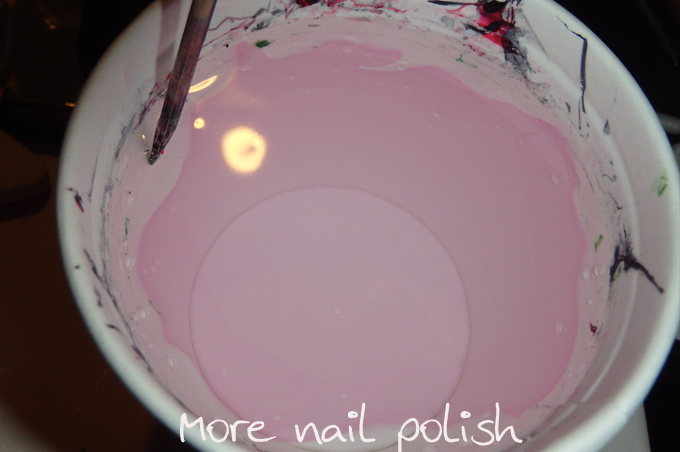 One thing I've found is that not all polishes from a particular brand will work. 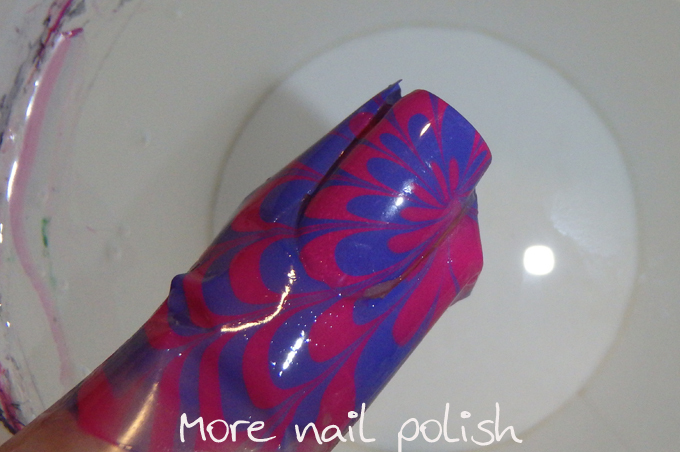 All I can recommend is to try different polishes and brands to see what works for you, also, look at other watermarble nail art and see what polishes they used. Water at room temperature is important. It hasn't mattered to me whether is was filtered or not, I just use tap water and ensure its not too hot or cold. If your first drop doesn't spread in a nice circle (example below), grab a toothpick and run it around the edge of the cup, this makes the polish spread further to the edge. Don't let that first drop dry out, if it drys out then the second drop will never spread Make sure there isn't a heater or fan blowing where you are working and drop the first few polishes fast. I even recommend dropping the first colour 3 times straight after each other. 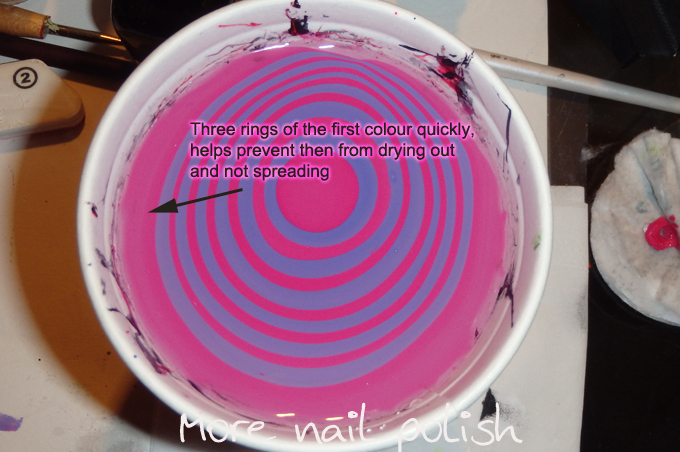 This makes the first ring thicker and less likely to dry out before switching to your other colours. Because I did this bullseye for these photos, I had to put my finger in to see the end result. 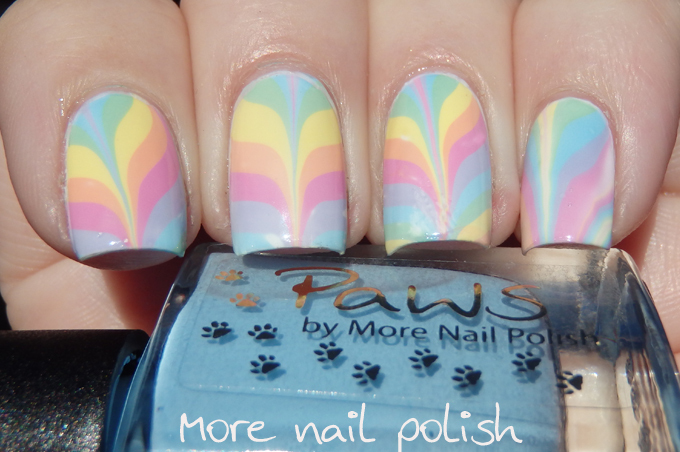 I seriously love my Paws water marbling polishes so much! Between bullseyes, clean the top of your water. If it's not clean, your first drop will not spread out at all. 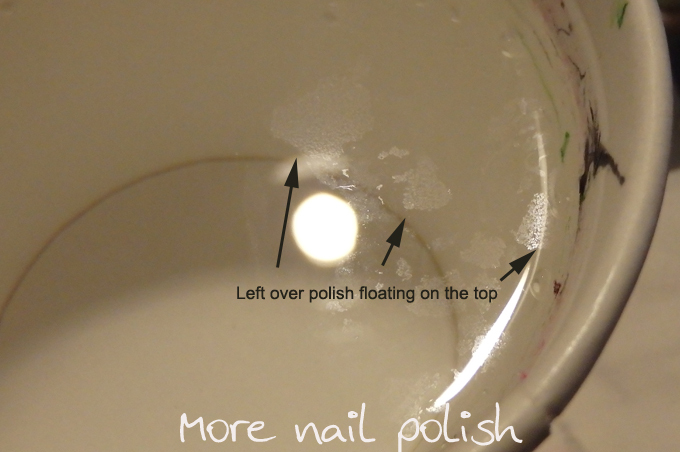 Usually the water has lots of very fine bits of polish floating on it from where you cleaned up the top of the water before you took your nail out. The way I clean the water is to put a drop of Seche Vite on it. I then run my toothpick around the edge of the cup until you can see the Seche Vite has spread out totally to the edge. The Seche Vite will dry fast and look wrinkly on the water, it will also contract inwards pulling the floaties with it. When you slide the Seche Vite out of the water in one large sheet, it takes all the floaties away. My cleaned up sample nail. 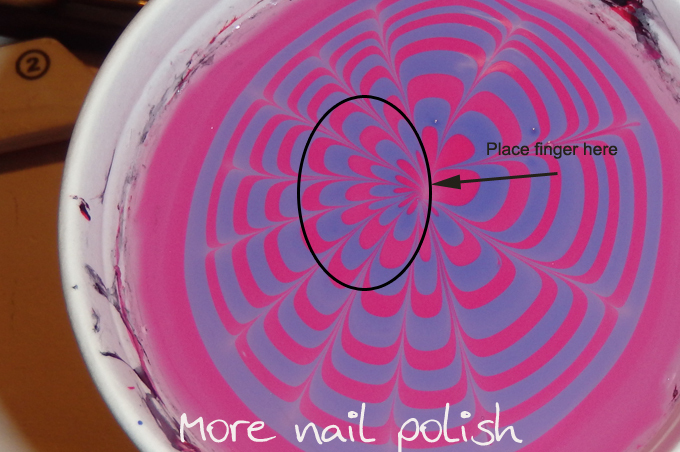 I hope these tips help you little bit, but if you have any more questions, please ask them below and I will answer them tomorrow night with another water marble post. That looks too cool! Love it!! 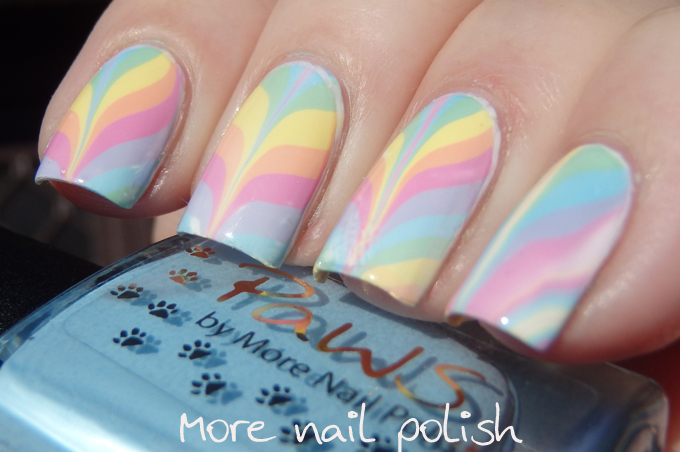 It would look so good matte too... reminds me of smarties candy! They are definitely all cremes and they are all made with suspension base and liquid tints that I purchased from Australia's only supplier of polishing making products. Is there any way to protect the rest of your finger from getting all that polish on it? If you look closely you will see that I have clear sticky tape wrapped around my finger, that pretty much only leaves two little square corners to clean up. I've heard of people using vaseline and PVA glue with success too. 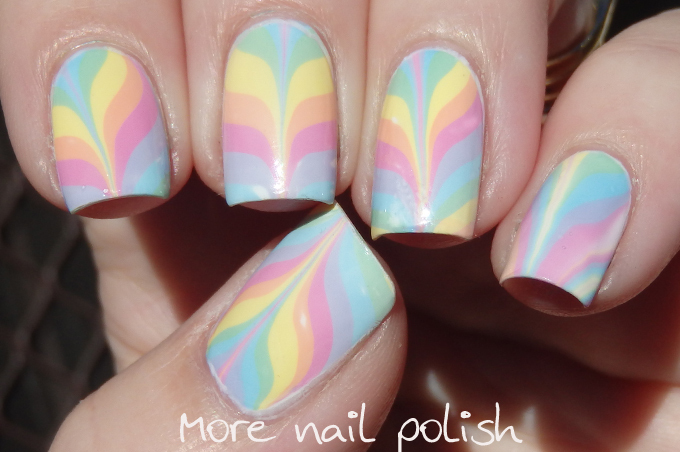 These look gorgeous, the pastels go so well together! 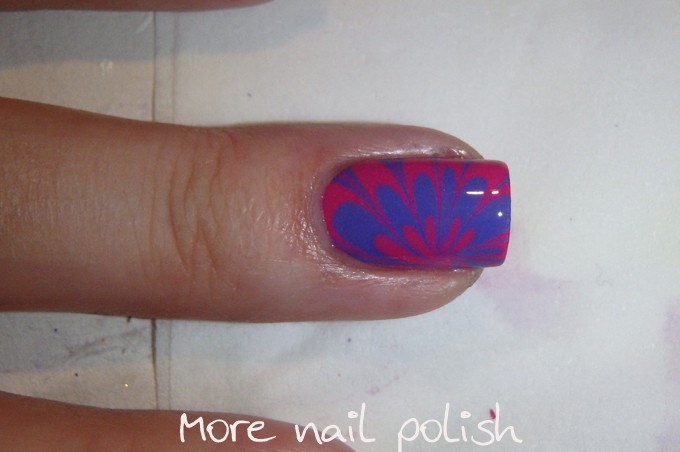 Wow, you've explained the watermarble so great, and your sample design was so gorgeously done. I actually aways struggle when trying to remove those little pieces from the water and it never occur to me to use fast drying topcoat to clean them up. I will totally use this on my next one. 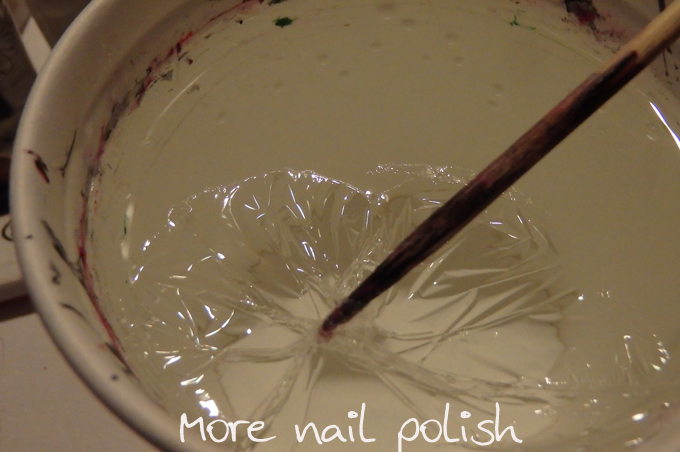 I also think that the most important thing is to try with polishes. 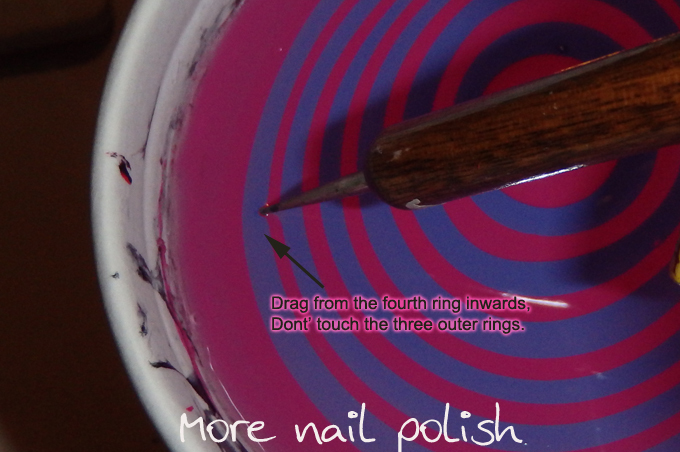 Also I could add that really important is that the polishes should also spread into each other.